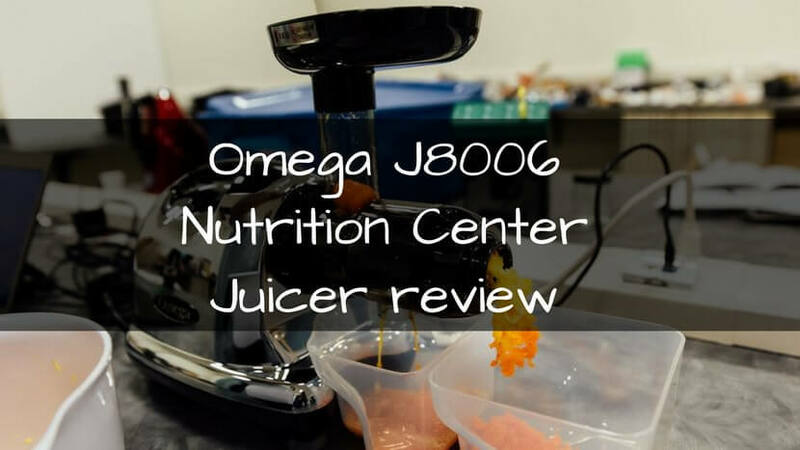 The Omega J8006 is a well-built, beautifully styled macerating, best cold press juicer with a low-speed motor making it extremely quiet. But it is so much more than a juicer as the name suggests this is a Nutrition Center capable of not only producing high-quality juices but also all natural baby foods, frozen desserts, even nut butter. Comes complete with a comprehensive user manual which includes safety guidance, assembly instructions, clear diagrams, and information on the different tools required for the many processes it’s capable of performing. You will find a Helpful Hints section on how to juice various elements including wheatgrass, soft fruits, vegetables, and things such as how to grind coffee beans and extrude pasta. The juicer has been well designed, with a solid horizontal style incorporating a moulded handle and sleek styling in a choice of eight colors including high shine chrome, black and for a pop of color why not try fire truck red or pastel pink. It is simple to assemble with clear instructions available in the enclosed instruction manual. Cleaning is simple with the components easy to remove, wash with either hot soapy water or pop them on the top shelf of the dishwasher. Consuming enough fresh fruit and vegetables can often be tricky, so enjoying a freshly prepared vitamin packed juice drink is a fantastic way to do this, especially for children. Juice fruit, vegetables, wheat grass, etc. quickly and easily. With two handy collection pots included, one collects the juice, the other catches the pulp (try putting the pulp in your compost the worms love it!) it couldn’t be simpler. Due to the efficiency of the machine the juice produced is not frothy as it can be with some juicers. For a superior, full-bodied taste you want a process that doesn’t produce oxidisation (indicated by froth), allowing it to be refrigerated for up to three days. Retains maximum amount of nutrients, and vitamins in the juice. This is a juicer that will look good in any kitchen with a choice of eight different. Includes cleaning equipment and detailed instruction manual. The shoot is quite narrow at approximately 1.5” so fruits, vegetables, need to be cut up quite small before they can be juice/processed. An extremely well-built and designed juicer with a lot of additional applications besides preparing juices. The design is sleek and contemporary and would look decent left out in a kitchen. Easy to assemble and use it has a multitude of applications from extruding pasta to homemade nut butter and healthy baby food. Store the juice in a refrigerator for up to three days, and it can tackle hard to extract items such as wheat grass, with ease. 3,000+ Amazon reviewers have given the Omega J8006 glowing reviews, 76% awarded it 5 stars with an overall rating of 4.5 out of 5 stars. Combine this with its extended warranty, excellent build quality and various usages and this juicer would be a sound investment. My Omega Nutrition Center Juicer Recipe Book: 101 Superfood Juice Recipes for Energy, Health and Weight Loss! Chef’s Star Glass Water Bottle 6 Pack 18oz Bottles for Beverage and Juicer Use Stainless Steel Caps with Carrying Loop – Including 6 Black Nylon Protection Sleeve. How Long Does Cooked Salmon Last In the Fridge? KeepSpicy is a participant in the Amazon Services LLC Associates Program, an affiliate advertising program designed to provide a means for sites to earn advertising fees by advertising and linking to Amazon.com. Additionally, KeepSpicy.com participates in various other affiliate programs, and we sometimes get a commission through purchases made through our links.